California’s Santa Barbara County is a huge, diverse region that delivers everything from crisp, refreshing whites, savory Pinot Noirs, peppery Syrahs, and concentrated, structured Rhône and Bordeaux variety blends. Given this incredible diversity, it’s critical that consumers understand the different regions and what each delivers. 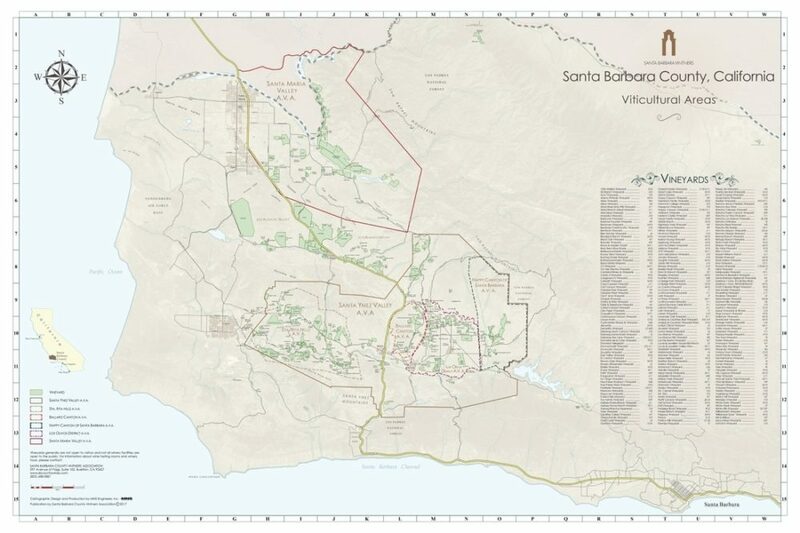 Looking first at the high-level Santa Barbara County AVA, an all-encompassing AVA that consists of six smaller sub-AVAs: Santa Maria Valley, Sta. Rita Hills, Santa Ynez Valley, Ballard Canyon, Los Olivos District, and Happy Canyon of Santa Barbara. Each region has a distinct climate, driven mostly by its distance from the Pacific Ocean, as well as a focus on different varieties. 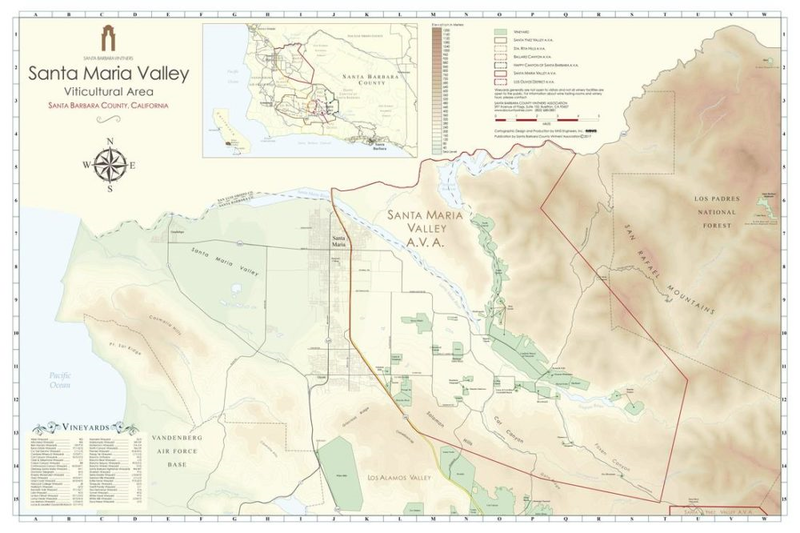 The Santa Maria Valley AVA is in the northern part of Santa Barbara County and is a west to east- running valley influenced heavily by the Pacific Ocean. The prime grape varieties here are Pinot Noir and Chardonnay, yet there’s a number of brilliant Rhône variety blends as well. The key vineyards are Bien Nacido, Solomon Hills, and Sierra Madre, with other notables including Riverbench, Le Bon Climat, Dierberg and Cambria. While it doesn’t have its own AVA, the Los Alamos Valley lies just to the south of the Santa Maria Valley, to the north of the Sta. Rita Hills, and has several notable vineyards. This region is slightly warmer than both Santa Maria Valley and Sta. Rita Hills, yet cooler than the Santa Ynez Valley. The Sta. Rita Hills AVA lies south of Santa Maria (and the Los Alamos Valley) and is a west to east- running valley open to the Pacific on its western edge. This is a cool, marine-influenced region that warms the further east and inland you go. It’s primarily Pinot Noir and Chardonnay territory, yet it’s possible to ripen Syrah (and even Grenache) on its eastern edge. In general, the Pinot Noirs from the Sta. Rita Hills show a savory, structured style (especially when compared to example from the North Coast and Santa Lucia Highlands), with loads of spice, red fruits and dried herbs character. Notable vineyard sites include: Babcock, Bentrock, Cargasacchi, Clos Pepe, Dierberg, Eleven Confessions Vineyard, Fe Ciega, Fiddlestix, Hilliard Bruce, John Sebastiano, La Encantada, La Rinconada, Melville, Mt Carmel, Radian, Rita’s Crown, Sanford & Benedict, Sea Smoke, and Turner. Located to east of the Sta. 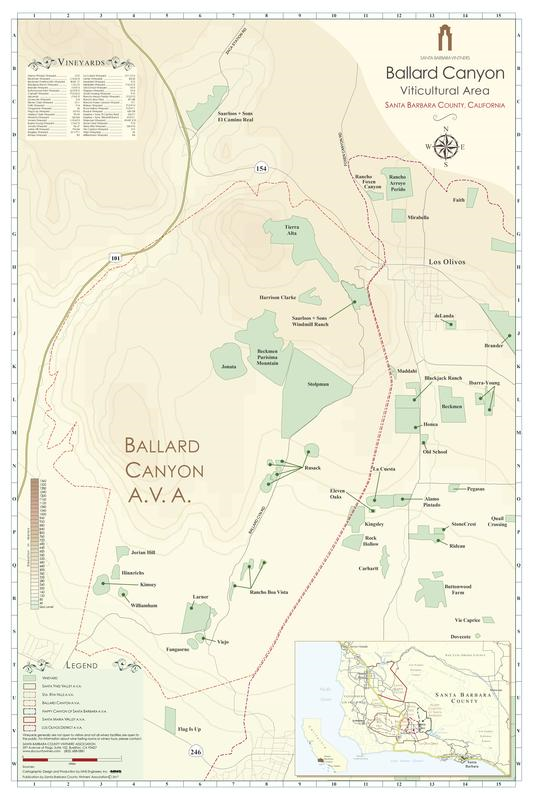 Rita Hills is the Ballard Canyon AVA, a tiny appellation covering roughly 550 acres mostly planted to Rhône Varieties. This north to south-running valley starts at an elevation of just over 500 feet above sea level in the south and tops out at 1,165 feet at its northern border. The soils are limestone dominated near the bottom (Kimsey Vineyard) and become more and more sandy as you progress up the valley. 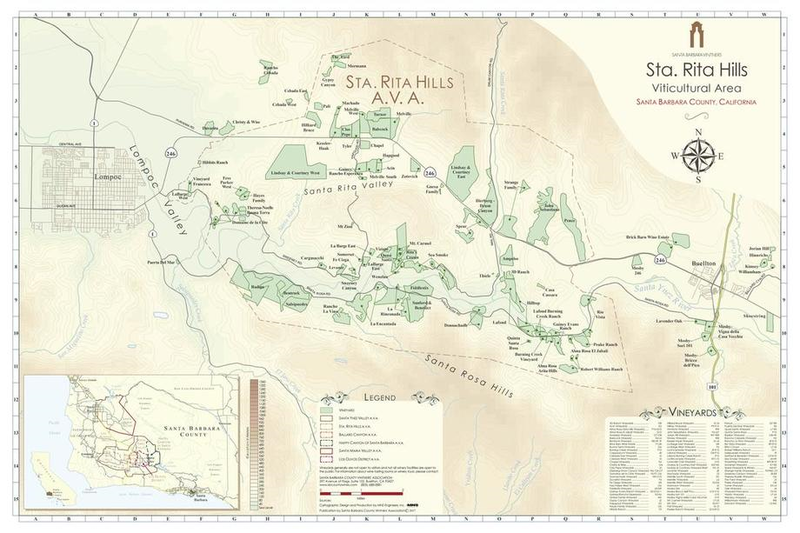 Notable vineyard sites include: Jonata, Kimsey, Larner, Rusack, Harrison Clark, Tierra Alta, Purisima and Stolpman. 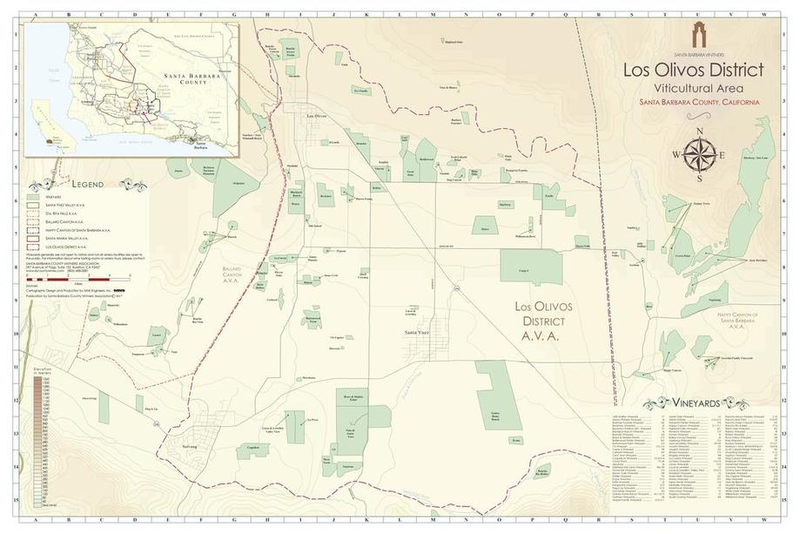 The Los Olivos District AVA is a newly created AVA that stretches from the eastern edge of Ballard Canyon to the western edge of Happy Canyon. It’s slightly warmer than the Ballard Canyon AVA, and cooler than the Happy Canyon of Santa Barbara region located to its east. This region specializes in the Rhône varietals of Syrah, Grenache and Mourvèdre. The notable, rolling hillside vineyards include: Camp Four, Fox Family Vineyard, Honea, Tensley, and Williams-Dore. 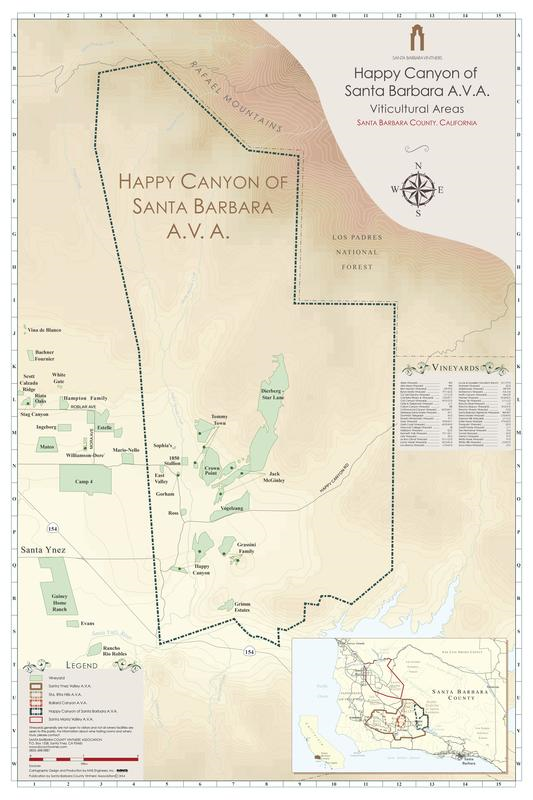 Lastly, the Happy Canyon of Santa Barbara County AVA is located on the eastern edge of the Santa Ynez Valley AVA and is the warmest sub-AVA of the region. This is Bordeaux territory and is primarily planted to Cabernet Sauvignon, Cabernet Franc, Merlot and Petit Verdot, with a small amount of Sauvignon Blanc. Notable vineyard sites include: Dierberg Star Lane, Grimm, Grassini, McGinley and Vogelzang.